Stories of the trials, tribulations, and the joys of sharing a garden with two energetic Miniature Pinscher dogs. One key part of growing and maintaining a lower maintenance landscape is to focus on preventing problems the whole year round. Late January into February is a key time for controlling weeds and pests like slugs, the longer days and warming temperatures signal the pests to wake up and get busy. Weeds: In my own garden I have noticed some weeds starting to flower – flowers now equal seeds later. I need to weed them out before they spread all over. The key point here is I noticed them, it is important to get outside in the winter and evaluate the situation. Bittercress and other weeds in the path of my blueberry patch. If I only have limited time to weed , I would concentrate on pulling the bittercress. Blooming or ready to set seed weeds should get immediate attention. Slugs and snails: If one is going to bait for slugs, now is the time to start it. Over-wintering slugs and snails are waking up and getting ready to start their new families, the more you can catch or kill with bait now the fewer there will be to lay eggs; if you reduce the population now, you will probably use less bait over the year. Yellow jackets/hornets: While hornets are great predators of many garden pests (they will carry off and eat cabbage worms!) they have a nasty sting if you disturb their nests (often in the ground). Setting out baited traps in late January to catch the queens before a big nest is built, can reduce the summer hornet population. Link: Information on hornets on the University of California's IPM site. Quince, summer 2015, in my "mini front yard orchard"
Diseases: Cleaning up dead and damaged plant can help reduce over-wintering diseases and other problems. In the organic garden it is really important to keep things clean as there are limited organic chemicals to fix problems once they start. I have cleaned up all of the fallen leaves in my mini orchard and veggie gardens and will put down a fresh layer of clean mulch (bark dust or commercially made compost) to hopefully bury/smother any over wintering diseases. Keep notes: When you notice a pest emerging in the garden make a note on next years calendar to remind you to check on it. While winter is a great time to catch up on napping on the sofa, time spent tending the garden in winter will allow more time for napping in the sun on the patio in summer! This year has been awesome for tomato growing! Early warm weather, late warm weather and limited rains have promoted huge fruit set and very limited diseases in my garden - all of that is about to change. Heavy rain is forecast for next week; in my garden it is officially time to move into fall and winter gardening mode. For the past several weeks I have trimmed new growth, removed small fruit, watered deeply once or twice a week, and watched for diseases. This evening I plan to pick any cracked fruit to ripen inside, remove all fruit that won’t mature before the first week in October. The night before the heavy rain is forecast I’ll pick any fruit that has started to color to ripen inside. How late I leave the plants in the garden will depend on the weather and the health of the plants. Green tomatoes harvested from The Campbell Community Garden, October 11, 2012. At least 3/4 of these ripened in my garage. We were able to donate ripe tomatoes to the food pantry for Thanksgiving dinner! Most years I have had excellent results with ripening green tomatoes in my garage. 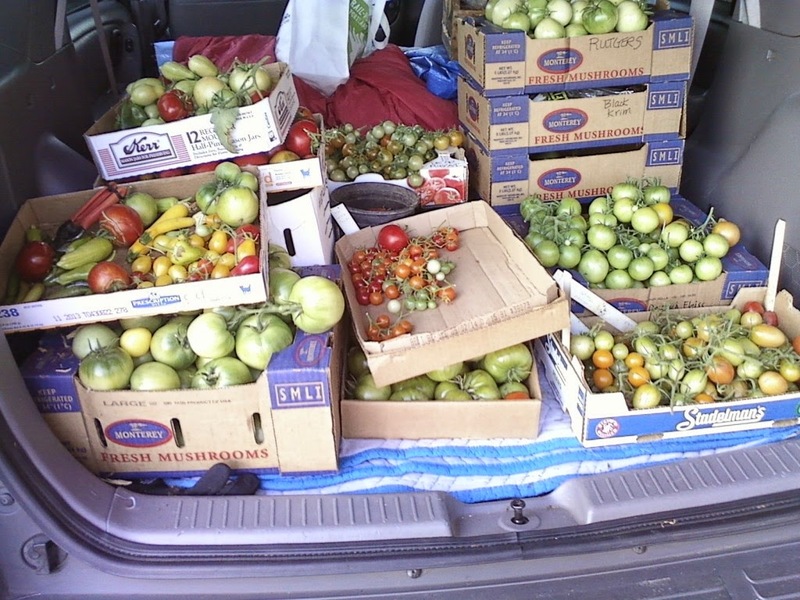 Two years ago we picked six boxes of green tomatoes and most all ripened (we had tomatoes for Thanksgiving!) Last year September was wet and cool, disease set into the plants and nearly all of the tomatoes rotted from blight. Pick mature fruit (mature tomatoes have turned from deep green to whitish and have well-formed seeds inside). Near ripe tomatoes are spread out one tomato deep in card bard boxes and left in my garage to finish up. Green tomatoes are wrapped individually in newspaper and layered tow or three deep in card board boxes; a couple of times a week I inspect them and move riper tomatoes to the top of each box, any damaged fruit is tossed. 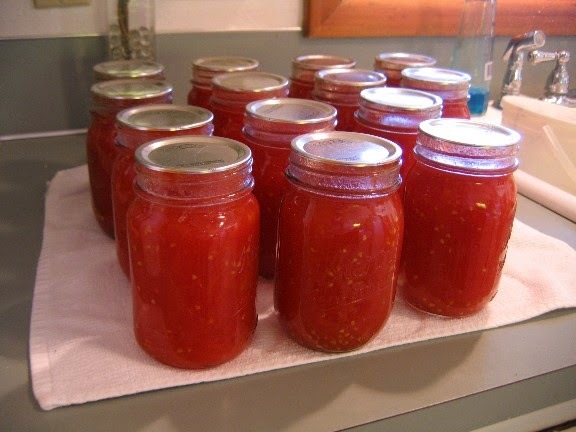 Canned tomatoes: So far this year I have canned 46 pints of tomatoes...29 to go to meet my goal of 75 jars! While it isn't completely over yet, I declare the 2014 tomato harvest a bountiful success! 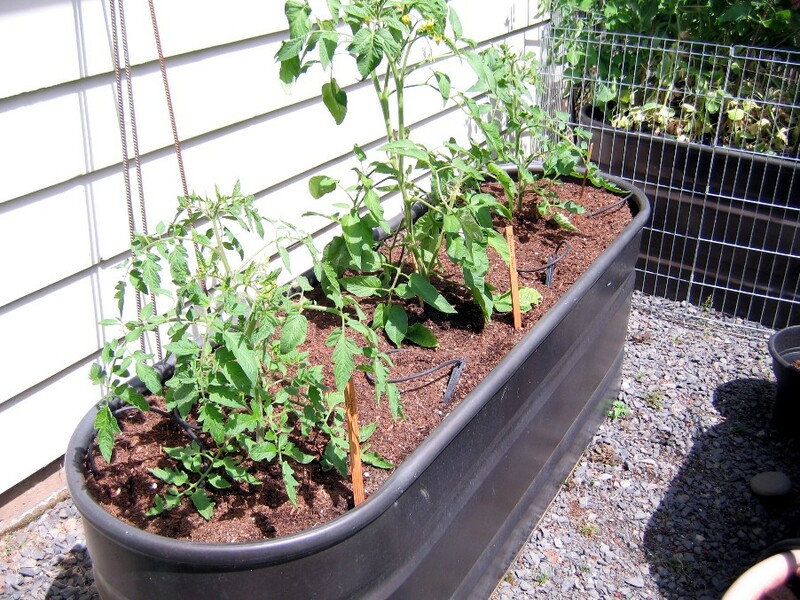 They are easy to grow, other than the first several weeks of growing, they don't need a thing other than watering until harvest time. Fresh, good quality, affordable, organically grown potatoes at the grocery store can be hard to find. Selection at the grocery store is often limited to the standard varieties, like russet, red, and Yukon gold. Freshly dug potatoes have GREAT flavor! Potatoes fit right into my garden plan of growing: what we like to eat, what is best grown organically, what may be hard to find in the store. This year we are growing Kenebec, French Fingerling, and German Butterball. We purchased the potatoes from Concentrates; do not use regular grocery-store potatoes, they may have been treated with a chemical to keep them from sprouting. We have them planted in our home garden (in big tree pots) and in our community garden plot (in the ground). French Fingerling Potatoes, cut up for planting, we made sure each section had 2 or 3 growing eyes and left the cut pieces out to dry for a few days before planting. Potatoes should be planted in early spring, a few weeks before the last frost. They are planted shallowly to start with and soil is mounded over them as they grow- this produces more potatoes than just planting and forgetting them. As the potato plants grow up through the soil cover the stems and lower leaves with soil eventually ending up with the soil around the plants "hilled up" a few inches higher than the surrounding ground. We dug a deep hole in one of our community garden beds and covered the potato pieces with a few inches of soil, as they start to grow we will fill in with more soil, just keeping a few inches of green above ground. Flowering potato plants signal that actual potatoes are forming. When the plants yellow and die back, that signals it's time to harvest. These are the potatoes harvested from our community garden plot last fall. The planting and harvesting doesn't take a break for winter in my gardens. Now is the time to really get serious about planting crops to harvest in fall, winter, and early spring. I have cabbage and Brussels sprouts planted in pots waiting for the summer crops to be pulled, and peas were planted in the space opened up after the garlic and shallot harvest. Sprouting broccoli, great because once you harvest the main head, little heads will sprout out below, plus the leaves are tasty too! While the winter garden is not as productive as the summer garden, winter gardening has it's rewards, one of which is limited pressure from pests; other than slugs/snails, most pests slow way down or are gone during the winter. Success and harvest time of the winter garden depends on the weather; if your plants just seem to be sitting there doing nothing, don't worry, they are growing roots and getting ready to take off as soon as the weather warms just a little. 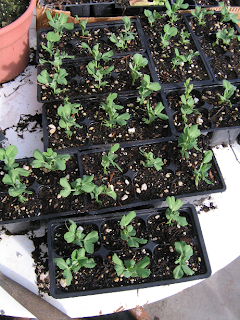 Cascadia peas, started in pots, waiting transplant. This winter I will be growing garlic and shallots, peas, lettuce, kale, cabbage, Brussels sprouts, herbs, beets, chard, leeks, radish, sprouting broccoli, and arugula. If the weather cooperates, I'll quite a harvest. If you want to start a winter garden, here are a few tips, with a list of links at the end of this post. Clean up summer debris, especially fall fruit and leaves of any diseased plants. Plant cool weather seeds-- radish, lettuce, arugula, beets, mustard greens; keep in mind that seeds may take longer to sprout in cool weather. 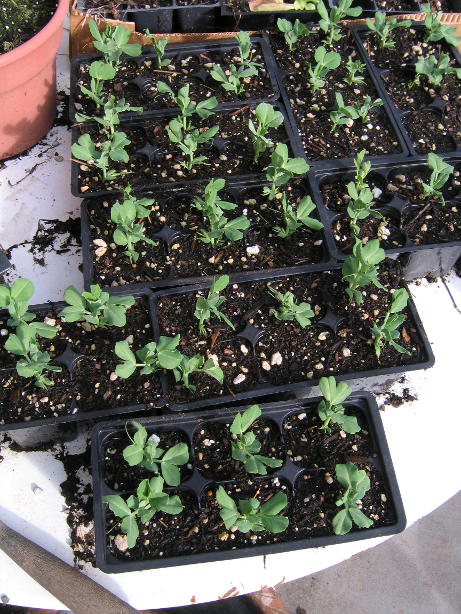 Plant cool weather transplants --Kale, cabbage, Chard, peas, etc. Plant Garlic and shallots in mid to late October, they will be ready for harvest in July, so place them accordingly. Control Slugs -- hand pick, beer traps, or iron phosphate bait. Soil Test -- check pH yearly, do a complete soil test when building a new garden, or whenever things just are not growing well. Mulch or cover crop all bare soil. Bare soil can be compacted or eroded by winter rains, and bare soil is the perfect place for weeds to grow. 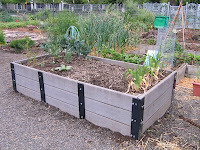 Oregon Tilth’s Toolshed: http://tilth.org/education-research/organic-education-center/the-toolshed Links to factsheets, resources, and a good planting calendar for our area. Most all of my landscape design clients want sustainable or "green" features in their landscapes; native plants are often requested, as are water saving features. For the past 18 months, I've had the pleasure of working with a client who sees sustainability way beyond a few native plants and low water usage. The design process started right after she purchased the house. We evaluated the site to see what features we should keep and what features needed to be protected from the extensive remodel she was about to undertake. Plants to save or protected and materials for re-use were noted, and a master site plan for circulation and hardscape features was drafted. We planned out construction phases to work with the budget, remodeling schedule, and planting seasons. The first phase was transplanting plants, removing weeds and undesirable plants, rough grading of the site, and mud control. The second phase was installing raised beds for a spring vegetable garden. The third phase was installing the hardscape elements and planting key plants for privacy and screening. This is the view from the front door and living room. The floor of the seating area is built of concrete slabs salvaged from the original front porch. Arbutus and Pacific Wax Myrtle were planted to eventually screen the view to and from the street. The fourth phase was planting a few areas close to the house that could be used for summer entertaining and relaxing. The plants in this bed are visible from the kitchen and master bedroom. A crape myrtle was chosen to provide year round interest and some shade for the patio while not shading the solar panels on the roof. A shady seating area was created under an existing Dawn Redwood. The rocks framing the area are from the original steps up from the patio. The fence is juniper, it will last for many, many years with no need for chemical preservatives. The fifth phase will come this fall, it will include planting perennial plants and more small woody plants. An arbor and shed will be constructed as the budget allows. This year we are growing 9 tomato plants, 3 in our home garden and 6 in our plot at the Campbell Community Garden. Two varieties that are new to us, Dejena Lee's Golden Girl, and San Marzano Redorta, plus our tried and true Better Boy, Sioux, and German Giant (which had huge fruit last year). The weather has been nearly perfect for getting an early start, some years I wait to get my warm weather plants into the ground until the end of June or even early July, but not this year; we planted the first week of June! Sioux, German Giant, and Better Boy tomatoes; you can see the peas fenced off to protect them from the dogs in the background. Building a good garden takes several years. 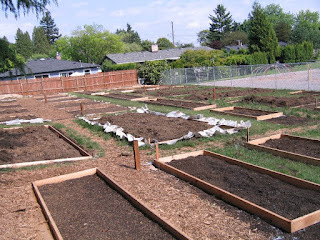 One must spend time amending the soil with compost and other goodies, adjusting PH, etc. Getting to know the micro climates of a site takes time as well. And the bank of dormant weed seeds (brought to life by tilling, fertilizing, and watering) need to be exhausted. I spent the past year planning a NEW community garden, just over a block away from my house! The 11,000 square foot garden has space for 15+ blueberry bushes, a long row of rhubarb, and 4,000 square feet of planting beds divided up amongst 32 plots, plus room for a shed and work tables. My own plot is 10 x 21, and with it so close to home, I expect to double the yield of the "old" garden. Community gardening has taught me a lot, especially that the "community" part is almost better than the "gardening" part. I'm getting to know my neighbors, many of whom I have lived only a few blocks from for years but never met before starting this project; those strangers are becoming my friends. Sharing produce with my Fathers neighbors, influenced my decision to plan 4 of the plots in the new garden as donation beds, where the gardeners (my neighbors!) will work together to grow produce for our neighbors in need. Gardeners with a glut of stuff to harvest can donate produce from their individual plots as well. Campbell Community Garden, under construction! We start planting on June 1st! I try to avoid using pesticides in our garden, even organic pesticides (they are often chemicals after all). However when I decide that a problem warrants the use of a chemical control, I want it to be as effective as possible in the smallest dose. Using garden pesticides frugally is not only better for the environment, it is better for the pocketbook. "All land slugs and snails are hermaphrodites, so all have the potential to lay eggs. Adult brown garden snails lay an average of 80 spherical, pearly white eggs at a time into a hole in the soil. They can lay eggs up to 6 times a year, and it takes about 2 years for snails to mature." The First Harvest of 2012! Noise: the Agribon row cover is quiet in the wind. The plastic made a huge racket on windy nights, the neighbors never complained, but I did worry about keeping them awake. Moisture: Although this winter has been pretty dry, the beds have done just fine on their own, not too wet and not too dry; just right. I did water them once last month with fish fertilizer. Both the plastic and the Agribon have one other un-advertised benefit: they keep the dogs out! Last night the dogs were out in the garden when I went out to pick greens for the Man of the Houses Valentine's dinner, as soon as Barberry heard the metal mixing bowl hit the gravel by the beds, he was right by my side anticipating the first harvest of 2012! I picked rosemary to add to whole wheat dried tomato bread, and greens to braise with Oregon Albacore Tuna. I'll pick the broccoli in a few days; it has decent sized center heads and lots of small side heads to pick later.